Look folks, I dont' mean to brag but I've had this idea for long now and finally I made it. I-GO is a searching utility that allows you to search the web from your desktop. A tiny application I-GO is 84 KB in size. but dont' underestimate it. I-GO can search many of today's top websearch engines and directories. You can search without going to their site first. I-GO makes it so easier to search for common things like downloads, files, music, and cracks. Also, get TV listings for your area and see what's on. 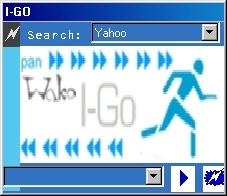 I-GO combines all search sites to further make the internet easier for you.